You come up with a personalized approach to weight loss that serves your lifestyle well. It’s seemingly painless which is wholly beneficial to your mind as it masters self-discipline. When you feel in control of your body and your brain, you’re able to complete your health and fitness goals more successfully. The following list of top weight loss tips will truly transform your life for the better. As mentioned above, test them out to see which ideas work best for you. Once you’ve come up with a few that are your mainstays, you’ll start to see yourself easing into a new kind of weight loss routine. Get started with these tips today. Know the difference between good carbs and bad carbs. Carbohydrates provide the body with a fast source of energy. Despite all the hype about low-carb diets, you need some carbs in your diet. The key to weight loss is determining which carbohydrates offer your body the best bang for their buck nutritionally. Some carbs are good while others are bad. You’ll want to stay away from refined carbohydrates which have been heavily processed to create something edible for you to consume. White bread, pasta, and rice can hinder weight loss by providing a lot of carbs and little nutritional value. Cut down on sugary drinks. Opt instead to drink zero-calorie H2O. Clear, crisp, and refreshing, water is among the most underrated diet tools that there is. Not only does it improve the body’s state by flushing out toxins and impurities, it also makes you feel full even when you haven’t eaten. Carry a refillable water with you while you’re on the go. Set up a water drinking reminder app on your phone. You’ll be alerted automatically to the best times of the day to drink H2O. Strength training helps with the aging process. Strength training is also known as resistance training. It helps build strength in the body and help with aging. It allows you to build a strong core which ultimately improves posture and balance while lowering your risk for osteoporosis. Work with a personal trainer to come up with a weightlifting routine that fits your needs. That way, you’ll be working on building strength and fighting the deterioration of your bones. Your frame will be nice and strong which helps support your muscles and keep you mobile as you grow older. Without a good night’s rest, your body isn’t able to work like it’s supposed to. You’re tired and sluggish which takes its toll on your metabolism. By making sleep a priority, you’re able to make better choices concerning your health and well-being. Your body digests food better when you lay on your left side. Make sure that you’re able to comfortably do so in bed. That way, you’ll be in the process of losing weight without doing a single thing extra to make it happen. 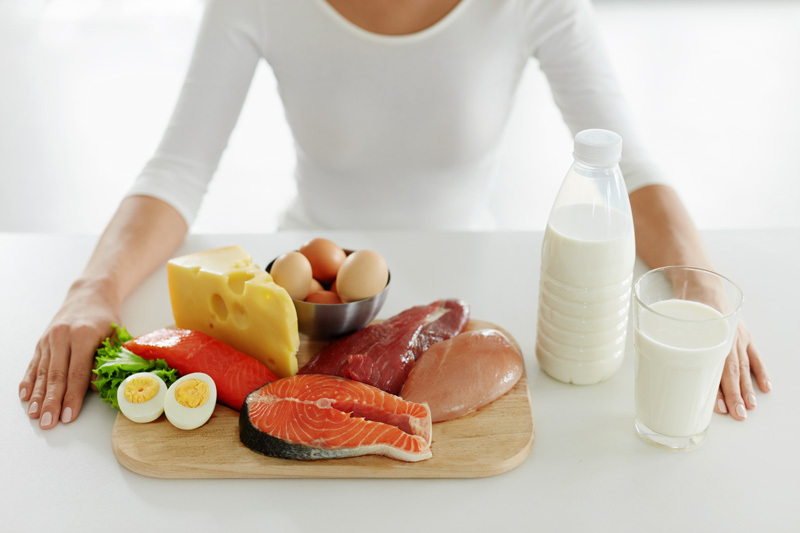 Protein helps you feel satiated. That’s why you should include high-quality versions of it in your meals. You can eat plant-based or animal proteins. You’ll want to make sure that it is hormone-free and grass-fed if you do opt to eat the latter. Try to consume farm fresh eggs and dairy, too, if they’re a part of your diet. It will help prevent you from overeating or snacking too much. Keep things moving with fiber. Fiber keeps you regular. It helps create bulk in the intestine so you’re able to get rid of waste easily. It’s essentially a broom for sweeping out the colon so you feel lighter and more energetic. Like with other substances, it’s important to include a variety of fiber-rich foods in your diet. Beans are highly underrated. They’re great for filling you up, providing you with protein and fiber, and helping keep your diet on track. Monitor your eating habits with a food diary or diet app. Keeping track of what you’ve eaten for the day helps you better identify room for changes in your diet. You’re able to see when you’re the hungriest and also notice if any patterns come up around eating. You may find that you eat more when you’re feeling stressed than you do when you feel like you’re in control of things. If recording the foods you’ve consumed is too much for you to do by hand, there are apps that help you with the process. You can even set them up so that they deliver alerts that make it easier for you to remember to record your data in them. 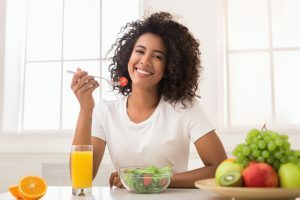 Taking a look at your eating habits allows you to correct imbalances immediately before they get out of control and become a big problem for you. Change the way you eat. So many women rush through their meals without much thought. They hastily eat at their desks and in their cars rather than at a table where they have greater control of their portions. Before you plow through your next meal at work, think about how to make mealtime more sacred. Bringing mindfulness into the equation helps you be aware of the choices you are making and how they’re affecting your body. Perhaps, meal prepping the weekend before will ensure that you’re not forced to eat from convenience stores and vending machines throughout the week. Take a few hours this weekend to cook large batches and divvy them up into individual containers that you can grab and take with you to work, school, and appointments for a fast, healthy meal. Snack to take the edge off hunger. Some diets eliminate snacking altogether which isn’t ideal for blood glucose levels which tend to dip when done digesting the food you’ve eaten. If you’ve ever experienced mid-morning hunger pains, you know how hard it is to concentrate on anything but how hungry you are until lunchtime. Having high-quality snack options that are packed with fiber and protein is ideal and a good way to help your body lose weight. You won’t be tempted to eat more than your share at mealtime because you know there is a nutritious snack waiting for you in your lunch bag or fridge. Some good examples of healthy snacks include nut butters that you dip your cut vegetables into, hard-boiled eggs, a handful of almonds or other nuts, sunflower or pumpkin seeds, lean cuts of meat, and even a small salad topped with chickpeas or other high protein beans such as kidney beans. Say goodbye to processed foods. Many foods are not fit to be eaten long-term. They come from manufacturing plants rather than plants you find in nature. Be wary of even the ‘healthy’ brands that come in packaging because they can be packed with fat, sugar, and salt like other commercial brands. Aim to buy fresh fruits and vegetables rather than packaged items. Buy whole grains and legumes regularly. If your supermarket has bulk bins, experiment with trying new ingredients by bringing home small amounts of the item to test out at mealtime. Make good health your goal instead of ‘being skinny’. Instead of focusing on your external self, try working on your internal self. By changing your mindset about good health, you’re able to make it a lifestyle habit opposed to a societal trend. You won’t just be ‘skinny,’ you’ll be the healthiest you’ve ever been. Understanding that your body is different than other people’s helps you with your weight loss journey. What may work well for one person could very well be detrimental to your health. That’s why diets don’t work but healthy habits do contribute to lost weight. Buy a fitness tracker and challenge yourself to walk more daily. Walking is among the easiest exercises there is. It’s low-impact, available wherever you go, and doesn’t require fancy equipment. As long as you have a good pair of walking shoes and a smartphone, you can track the number of steps you take daily. If you’d rather buy a fitness tracker to wear, by all means, do so. It will help you get very clear about the amount of movement you get in a day. Challenge yourself to move more by trying to beat the previous day’s data. Set goals you know you’ll be able to reach despite having a busy schedule. S.M.A.R.T. stands for Specific, Measurable, Attainable, Realistic, and Timely. If you want to further your success, set a few goals you know you’ll be able to reach. Give yourself non-food related incentives for completing them. Before you know it, you’ll have crushed your goals and become a more disciplined and resilient version of yourself in the process. You can then apply the S.M.A.R.T. goal-setting technique to other areas of your life. That way, you’re able to become a more well-rounded, happier version of yourself. Recruit an accountability buddy to keep you company along the way. Partnering up with a trusted family member, friend or co-worker can help you achieve your fitness goals faster. That way, you both benefit from the relationship. 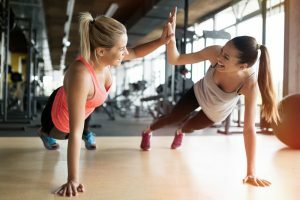 Finding other women with similar goals as yours makes it easier to keep the focus on losing weight. You don’t feel like you’re missing out because all of your friends are attending Happy Hour and gorging themselves on half-price appetizers and drinks. You’ll have someone in your corner that has prioritized weight loss and will be willing to do what it takes to make your goals and theirs a reality. Stress halts weight loss. It puts you in a position where you’re rationalizing bad choices. Before you open a package of cookies and devour an entire sleeve, think about ways you can make yourself feel better without the use of food. Self-care is very important and integral to your success. When you put your needs first, you’re doing your part to deal with stress in a productive way. Then, you’ll be able to approach the next obstacle with grace and without setting yourself back five or ten more pounds. Engage in exercises that make you feel good. Yoga is among the easiest exercises to take up. You don’t need anything more than a yoga mat and a desire to move your body gently. There are different levels of yoga, too, making it possible for you to start as a beginner and work your way up to an advanced practice. Yoga helps with posture and balance much like strength training. It’s a known stress-reliever, too. When you embody yoga and what it stands for, you walk away with a calmer, healthier presence than before. The suggestions listed here helps ignite change in your body and mind. You’re then able to approach weight loss from an entirely new place. You’ll be able to use what you’ve learned to successfully shed excess pounds and see food in a new way. Ignite the fire inside of you by turning your body into a fat-burning machine. Now that you know how to approach weight loss from a different standpoint by applying the many tip listed here to your daily routine, you’ll have a much easier time reaching your toughest fitness goals. Do your part to promote health and wellness in your body. Your weight loss journey doesn’t need to be difficult to be worthwhile. Through the small changes that you make to your routine, you’re able to see measurable results, one step at a time. 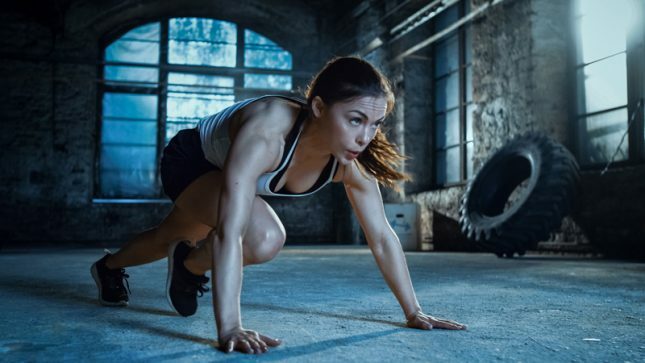 You’re also able to sustain your progress because you’ve been busy making lifestyle changes not focusing all your time and attention on the latest fad diet.